Tim Radford - Featured Ambassodor for March 2019. You know Tim Radford’s voice and you recognize him from his many Facebook live videos to share the latest in Cherokee County. Students love him for sharing the school delays and closings, pet owners appreciate his #missingpets efforts to reunite them with their family pets, and we can’t even begin to tell you about all of his Party Line girlfriends. However you know Tim, you know he is a local gem and always focused on sharing Christian love on the airways throughout the community. A native of Hanging Dog, Tim became the youngest radio station owner in North Carolina. He purchased the station at the age of 22, after his time at UNC Chapel Hill. He credits his time working in Raleigh with the experience and confidence to run his very own 1320 AM. He has made a great deal of investments in our community and strives to improve the ways he brings information and entertainment to the region. You can now enjoy WKRK - Murphy, NC at 105.5 FM, 1320 AM, Cable TV 25, country.am, Google Home, Simple Radio, Radio.net, TuneIn, Facebook Live, and you can even say “Alexa, Play WKRK Murphy” on your Amazon echo! 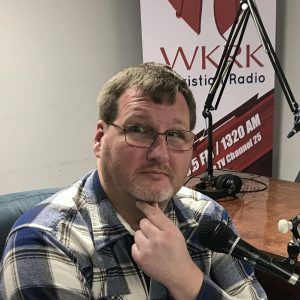 Tim’s love of our community is evident in all that he does to promote and share through WKRK. He is a proud member of Murphy Rotary Club, Tri-County Early College Business Advisory Council, NC Association of Broadcasters, Cherokee County Broadband Committee, Mayor’s Business Roundtable Advisory Board, Andrews Chamber of Commerce, Recover Our Mountains, Coalition for a Safe and Drug-Free Cherokee County, and best of all… Tim is one of our treasured Cherokee County Chamber of Commerce Ambassadors as well as a Tier 2/Engaged Member working tirelessly to promote our community. Tim’s favorite thing about Cherokee County is the small town atmosphere and friendly folks. If you’re visiting Cherokee County, his recommendation is to come and enjoy the Christmas parades. He loves seeing our neighbors come together to celebrate the festivities, with so many organizations working together in a loving and joyful way. If you can’t make it to the parade, you can definitely enjoy the WKRK Facebook live video and thank Tim for working so hard to keep our community engaged and informed! Want to get involved? Contact us about opportunities at 828-837-2242 or email.